﻿ Body frosting gift crate - edible treats reviews on EdenFantasys. 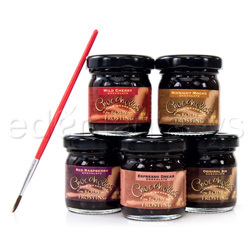 This chocolate body paint includes five delicious and different flavors. These chocolate body paints are FAT FREE! There are endless possibilities in how they can be used and will last you a long time. This is a great way to explore someone's body, and to lick body paintings off your partner, and have some good fun! With the Body Frosting Gift Crate you can make your partner into the dessert you crave most. It satisfies the sweet tooth, and allows your partner to get in touch with their artistic side. This set if a fabulous gift for anyone who likes chocolate. You can even use it in cooking! Great for new couples who are learning about each other's bodies or experienced couples who want something to spice up foreplay. This product really brings out your creative and artistic side. The different flavors bring out the gourmet chef inside us all and you and your partner get to create dessert together in a fun way.